I had high hopes for Burial at Sea Episode 1 and was kind of disappointed with the story and gameplay. I hoped the Episode 2 would see the story come full circle and tie up a lot of loose ends as well as give the series some nice closure. So did Irrational Game’s last effort do that? 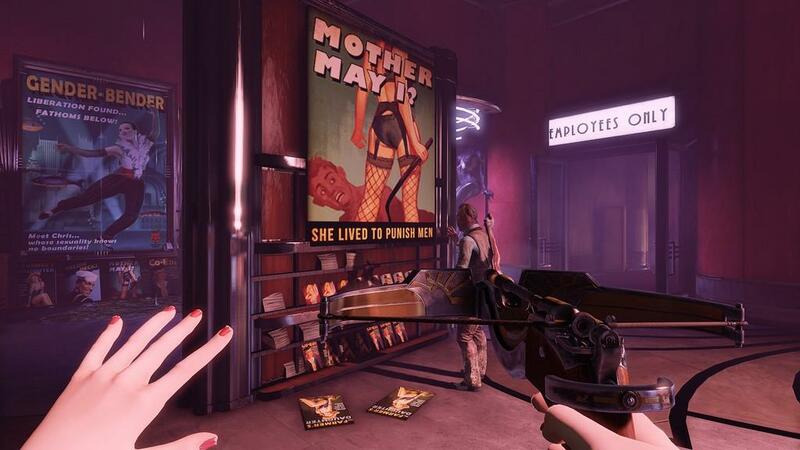 While you played Booker in the last DLC, this time around you’re going through Fontaine’s Department Store and Columbia as Elizabeth. Spoiler wise, this isn’t the same Elizabeth as the one in the first DLC pack something you find that out rather quickly. She’s an Elizabeth, but powerless throughout the game. The game starts off pretty close to when Burial at Sea Episode 1 ended. Atlas or Frank Fontaine from BioShock, is there and he’s trying to get back to Rapture. As you are about to be killed by one of his henchmen, you make a deal to take him back to the underwater city if he gives up Sally, the little sister from Episode 1. Booker DeWitt is along for the ride as Elizabeth’s imaginary companion. He gives her advice and some history as you progress through the game, but no help physically. Elizabeth is a far cry from playing as Booker. Unlike Booker, she doesn’t have any shields so the only thing she has is a health bar that does not regenerate. She’s a lot more vulnerable and she does a lot better using stealth techniques. This changes things up a bit from BioShock Infinite and Burial at Sea Episode 1, where I was able to get by plenty of areas with guns ablazing. To go with that theme, guns are limited to four types in Burial at Sea Episode 2. Also, most enemies will go down with one shot or a blow to the back of the head as long as they aren’t in an attack state. You’ll need plenty of patience to get through the game, which can turn off some folks. That said, exploration and taking things slow does reward you well in Burial at Sea Episode 2. You’ll want to sneak up on enemies to knock them out in order to conserve ammunition. Sneaking around involves Elizabeth crouching down and moving slowly and using cover as much as possible. Burial at Sea Episode 2 introduces the mechanic of different floor styles generating different volumes of footsteps so watch out for walking across glass as the crunching can alert your enemies and always try to sneak around on carpeted areas as the sound is a lot more muffled. Elizabeth has four weapons she can use. Two of those, the handgun and shotgun, should be familiar with those that have played BioShock Infinite. The crossbow was my primary weapon in the game and there are three types of ammo available. A tranquilizer bolt will knock out anyone with one shot as long as they are not attacking you. With the gas bolt, a group of enemies close together can be neutralized making this a very powerful piece of ammo when a few Splicers are around. If you want to draw someone’s attention, a noisemaker bolt will create that distraction for you. Finally, you’ll also find a radar gun that can make enemies explode provided you “cook” them long enough. But the lack of ammo and the ability to carry much ammo makes for a sometimes frustrating experience. And this time, there’s no one around to toss ammo to you to help. The limited amount of ammo makes the radar gun a very limited weapon. I fired it about four times and found one ammo cache for it so while it was fun to use, the fun doesn’t last. You’ll also run into a few parts near the end where the limited ammo and large amount of enemies will make you curse at Irrational’s decisions on how the last act plays out. Elizabeth is already at a disadvantage with no shields and no tear powers. Fighting off large amounts of enemies with little eve replenishment and little ammo can get downright annoying. A new plasmid helps in the cause to keep you stealthy and alive. The first one you’ll receive, called the Peeping Tom, gives you the ability to see items and enemies through walls as well as make you invisible. You’ll have to stand still to be able to keep seeing through walls because once you move, the ability is gone. Invisibility, lasting as long as you have eve, really comes in handy when you’re in a pickle and want to hide. It also serves as a nice way to get the drop on your foes. With a little amount of ammo available, the IronSides plasmid can take any bullets fired at you and feed them into your ammo stash. It sounds good in theory, but since you can only use it a few times, I found it more effect to use the old Possession plasmid to get the enemy on your side, have them try to take out a few themselves, and then do one quick blow to the back of the head to finish him if he’s still alive. The other two plasmids at your disposal is Old Man Winter and Possession that I mentioned earlier. They pretty much behave the same as in Infinite so not much new there. Like Burial at Sea Episode 1, the sky hook is a little limited in this DLC. You’ll find a few areas that you can hook up to and come down to attack, which does work well when you want to knock someone out from behind. You’ll need the enemies to be calm or in alert status in order to use your sky hook to take them out with one shot. If they have their sights set on you, you’ll only be able to stun them for a brief moment. Even when you go back to Columbia for a brief moment, the sky hook is really only used to reach an area that’s vital to the mission. There are areas where it was useful, but they are few and far between. The AI seems a little, I don’t know, dumber in Burial at Sea Episode 2? For example, Splicers would chase you relentlessly before. Here, it seems walking through a door and having it close behind you can confuse a Splicer. I tried to lure a few out to areas where there was a Big Daddy that I could use to dispatch them. As I was getting one to chase me, they stopped right as I walked through the door. Then again, maybe they were smart in doing this, but I saw a few Splicers just wander around in that area later on. I don’t know if Irrational Games made them more sensitive to going back to an alert state when losing sight of you in order to make the stealth gameplay a little bit easier, but it is noticeable in how quickly they go from chasing you to just walking slowly and trying to search for you. Sometimes they’ll just stand still and you’ll have some easy pickings with a weapon of your choice. 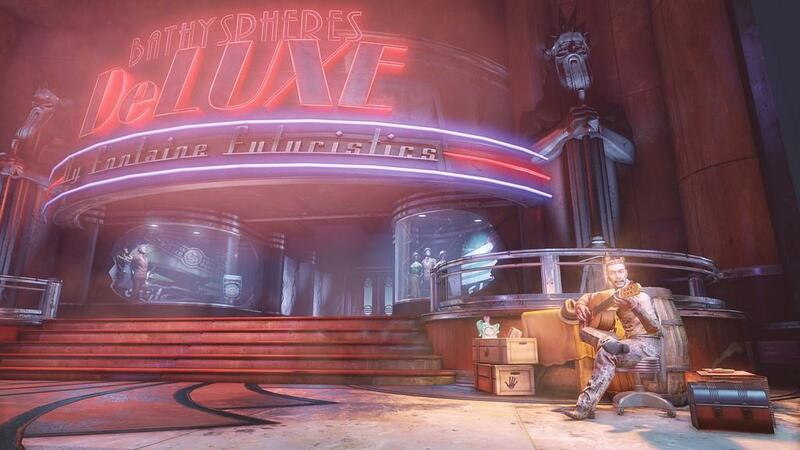 As for the story, Burial at Sea Episode 2 tries to tie BioShock Infinite with the original BioShock game. In a sense, it does succeed and when you are finished with the DLC, the story does come full circle. You’ll see the connections between Elizabeth and the characters from the first game, but it can sometimes be a confusing trip to get there. Connections also abound for other characters from both dimensions that explain why the two realities have some similarities. And you’ll get more information on the workings and origins of the Songbird and Big Daddies. Constance and variables. The writing had me lost a few times and it was a little hard to follow, but I have to say I was pretty satisfied at how it all comes together. You’ll also get a different perspective on some of the events that happened in BioShock Infinite, which I thought was rather cool. 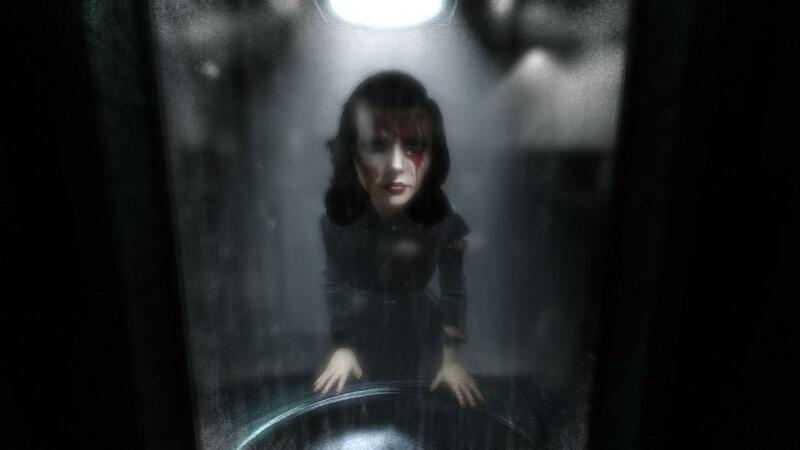 It is a bittersweet ending in a few senses and I’m sad that Irrational won’t be making any more games in the BioShock universe. For fans who wanted all the BioShock game to be linked, Burial at Sea Episode 2 does indeed do this for them. I did experience a lot of crashing with Burial at Sea Episode 2. BioShock Infinite and Burial at Sea Episode 1 ran pretty well and I don’t remember the game crashing at all previously. Here though, the crashes were pretty random. I had it happen when trying to use a plasmid. I had it crash right before the final shootout with me just standing there. A few times I had to redo some longer parts of the game due to me being kicked out of the game. While I was able to finish the DLC, the instability of Burial at Sea Episode 2 drew me out of the great atmosphere that Irrational Games created more often than not and caused some points of unnecessary frustration with the DLC. Burial at Sea Episode 2 is a definite improvement over Episode 1. It lasts for a few hours, but I can’t help feel this was a little bit artificial since you have to sneak around a lot more and take it more slowly in this DLC. Still, this might be the final visit to the city under the sea and you’ll want to soak as much of it in as possible. If you don’t like stealth games, you’ll have a tough time with this one. Overall, I found Burial at Sea Episode 2 to have many good moments and was an enjoyable DLC, when it wasn’t crashing to my desktop.